Due some administrative errors on my part (Dan) the advertising of the Cherished Blogfest was greatly diminished. Several people who read my entry, suggested that they might have participated, had they known earlier. So, we decided to extend the deadline until next Sunday, October 22nd. Now, please don’t start procrastinating. Pick an object, did up a memory, share a story and meet new friends. The official list opened at 12:01 AM (GMT) on Friday, October 13, 2017. Joining the blogfest is as easy as ever. Once you’ve written you post, click here to add it to the list. Remember – the list is open until 11:59 PM (PST) on Sunday, October 22, 2017. The Cherished blogfest is hosted by Damyanti Biswas, Dan Antion, Cheryl Pennington, Peter Nena, Sharukh Bamboat, Mary Giese, and Kate Powell, Paul Ruddock, it is open to anyone who wants to tell the world about something or someone they cherish. Follow this site. All the announcements will be made here, including the URL for the Linky List (above) when the blogfest begins. Copy the badge and place it on your sidebar – you can do this now. This entry was posted in Cherished Blogfest on October 15, 2017 by Dan Antion. Following and looking forward to next year’s Blogfest. I have a few cherished things I’d love to share. Great! We hope to have some activity on the page this year, so the deadline doesn’t sneak up on us. Hi, Dan! 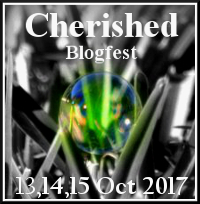 Is there a Cherished Blog Fest this year? When? If there is one this year, it will be in October (same weekend as last year). I won’t be able to organize it, but others are hoping to keep it going.